When I make a pie I use whatever fresh local fruit is ripe at the moment – it is a seasonal dish. In fall, pumpkin, then apple. Rhubarb is spring. And in summer, it’s cherry, raspberry and then peach. And plum. Oh, and blueberry. Well, in summer there’s almost everything. When Sara and I made our first pie together it was October, so it was pumpkin. That requires a rolled pastry, which is a delicate and difficult process. It was a challenging but successful beginning. Then one day this winter I found sour cherries in the grocery’s freezer. They were the “Lovable” variety, which I had just planted this past fall but had never tasted. I needed to know if it was worth nurturing this new addition to my garden –circumstances demanded I make an exception to the seasonal rule. 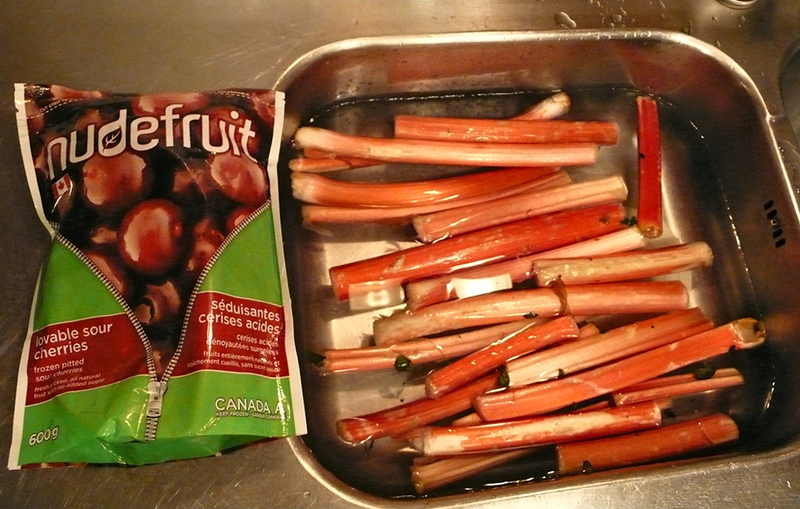 Sara wanted to try rhubarb, and that was available fresh from Holland (it can’t be in season there in January!?). 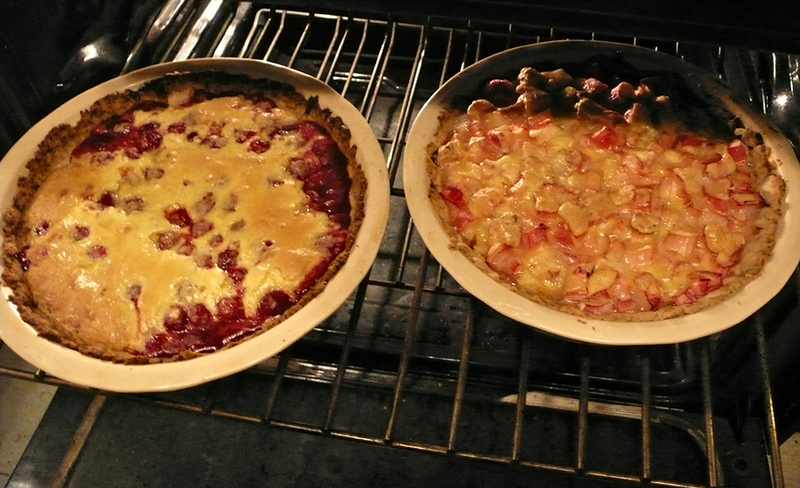 So with rhubarb and cherries we had our next bake date. This really is the pie for a beginner. The pastry for a soft fruit pie is completely simple and fail-proof – you mix it in the pie dish and pat it with your fingers to form the crust. Then you just fill it with the fruit, pour a simple custard over and bake. Those blue fingernails patting in the crust so perfectly belong to Sara’s twelve-year-old daughter, who likes sweets and came along to help. She wrote out the recipe on her mini-iPad as we went along. Her constant suggestion was to add more sugar. We didn’t but she liked the results anyway. Me too. Those cherries are going to be well looked-after in my garden. 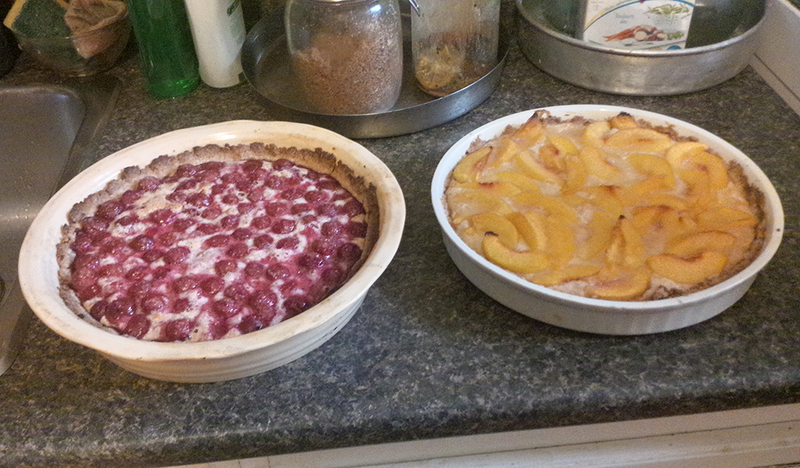 On her own, Sara’s dinner party pies: peach and cherry. She is a pie master already.